U.C. 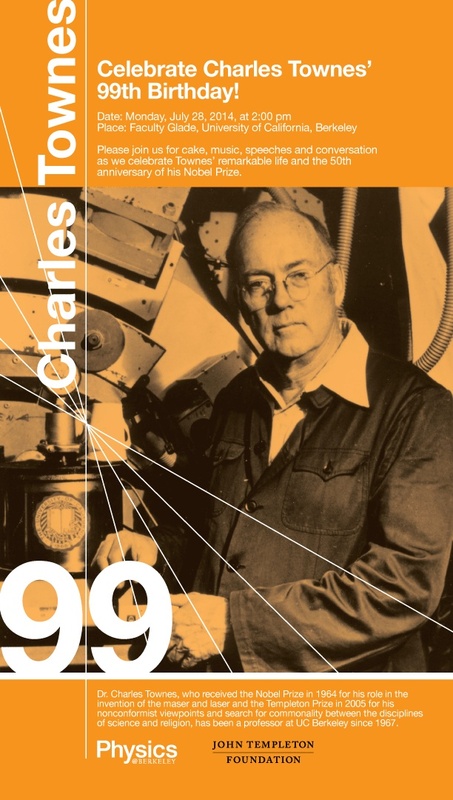 Berkeley Nobel Prize Winner and SSL Scientist Researcher, Professor Charles Townes will be turning 99 next week. Join the celebration! and help Dr. Townes celebrate this momentous Birthday milestone. The Nobel Prize for Physics in 1964 was divided, one half awarded to Charles Hard Townes, the other half jointly to Nicolay Gennadiyevich Basov and Aleksandr Mikhailovich Prokhorov “for fundamental work in the field of quantum electronics, which has led to the construction of oscillators and amplifiers based on the maser-laser principle”. You can also read the Berkeley NewsCenter article.